We have paired our Chicken Fried Chickens or Chicken Fried Steaks with flaky buttermilk biscuits & gravy. A perfect reminder of down home cooking at it’s finest! 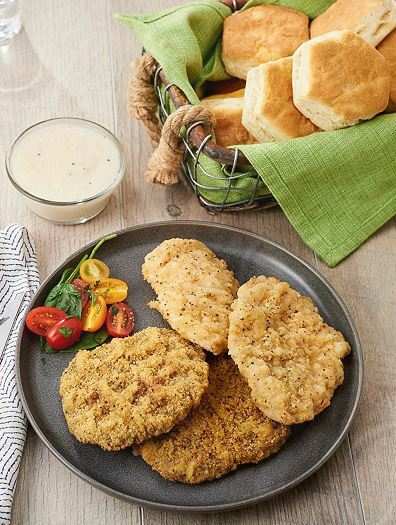 Same delicious fully cooked chicken breasts or par cooked sirloin steaks breaded with a special buttermilk seasoning, then large buttermilk flaky biscuits, just like grandma used to bake and finally a creamy & thick country pepper gravy to serve over both. Order on QVC in quantities of 9 or 18.
minutes until internal temperature reaches 165°F and breading is crisp. 7 minutes for even browning. Conventional Oven: Preheat oven to 350°F. Place frozen product on a sheet pan sprayed with non-stick spray. Bake about 30 minutes, turning every 10 minutes until product is hot and crispy. Depending on your oven, cook times may vary. Air Fryer: Place frozen steaks in basket, do not stack. Air fry at 390°F for 15 minutes or until product is hot and crispy, turning about every 8 minutes for even browning. Conventional Oven: Preheat oven to 350°F. Place frozen biscuits on a lined baking sheet pan or sprayed with non-stick spray. Bake about 12 to 15 minutes, just until the tops become a deep golden brown.